This autumn a few writers and illustrators will be on tour to ten theatre venues around the country. Full details on www.thechildrensbookshow.com It may well be my imagination but it seems less people are taking part this year. Nothing to do with books, but just a wonderful place to go this summer. There are various items of tree art but this one really took my eye...and lots of running space for children. Croft Castle, Yarpole, Herefordshire - an NT place. 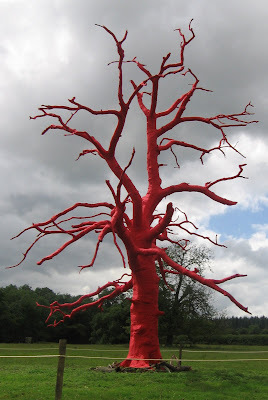 The old, dead oak is 46' high and was wrapped in heavy duty red cotton drill fabric by the artist Philippa Lawrence. First British Exhibition of Graphic Artist Kevin O'Neill is now on show at the ever enterprising Illustration Cupboard Gallery which can be found at 22 Bury Street, St James London SW1 - nearest tube Green Park. Perfect for teens and older. Illustrations, signed books etc for sale. If you can go to the BBC Home page, then to I Player (at the very bottom) click on BBC 2 and click on Newsnight Thursday 16 July then push the line under the picture until you get 40 mins in and you will see an excellent encounter between Anthony Horowitz and Anthony Browne on the merits or otherwise of the VBS system. Highly recommended. ...Government officials have suggested many authors will not need checks to visit schools. A spokesman for the Department for Children, Schools and Families said "These checks have been misunderstood. Authors will not have to register with the Vetting and Barring Scheme if they work with children once or infrequently. In fact, people working in schools will only be required to register if they work with children on a regular basis. This is because visitors to schools, even if they are supervised by a teacher at all times, are being placed in a unique position of trust where they can easily become deeply liked and trusted by pupils. We therefore need to to be sure that this trust is well placed in case pupils bump into them out of school where a teacher is not present. While we fully accept that the vast majority of workers or volunteers would never abuse their position of trust, parents would not want adults working regularly with young children, even on a voluntary basis, without any sort of background check at all." Gives me a shiver ... Of course no one wants children to be abused or put into any kind of danger. But, and this for me is a Mount Everest of a But, we do want children to talk and engage with adults. And we do want adults to talk and engage with children. That is how we all learn and live and enjoy life. And yes of course reasonable care should be taken...but should we monitor (for example) all corner shops where the kids go in, spend pocket money and have a bit of banter with the shopkeeper on a very regular (daily) basis? Of course not. The whole logic seems deeply flawed. An author could be liked and trusted after one visit and then where are you? What constitutes regular? Hints of Arthur Miller's "The Crucible"
I have tried to give the full link but for some strange reason it fails...but it is listed under Editors Choice. Children's Authors heading the front page of The Independent today, whatever next. When putting the various news blogs in I keep clear of comment but this seems so very stupid I can't resist. I can't imagine why a Labour Government should be contemplating this, or indeed any Government. Surely the very simple solution is that whenever anyone visits a school to speak a paid member of the school staff should be present at all times. 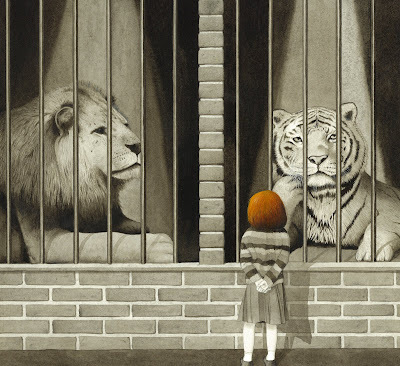 I was sorry to read that the new Children's Laureate, Anthony Browne and another good children's author, Gillian Cross should fail to see the slippery slope this ruling would begin. Where would the vetting stop? What about those booksellers taking books into schools? What about parents taking games after school? The list is endless. In fact the logical conclusion is for everyone in the country to be vetted ...1984 here we come quarter of a century on. Enid Stephenson in her personal capacity and not speaking for anyone else at Carousel as I haven't spoken to them! Carol Ann Duffy, the new Poet Laureate, is to chair the judging panel for a worldwide poetry competition for 7-11 year olds. The Competition is organised by the Children’s Poetry Bookshelf, a poetry book club for young people run by the Poetry Book Society. To link with National Poetry Day on Thursday 8 October, children will be asked to write a poem in English on the theme of ‘Heroes and Heroines’. Now in its fourth year, the competition is open to both individuals and schools. Cash prizes of £250 for first prize, £100 for second and £50 for third will be awarded, along with books and CPB memberships, in two age groups, 7-8 year-olds and 9-11 year-olds. Entries will be accepted from Thursday 10 September, up until the closing date of Monday 19 October. The winners will be announced at a gala celebration in London in December. The British Council partnership, established last year, will continue to encourage entries to the ‘International Learner category’ for children based outside the UK who are learning English as a foreign or second language. The Old Possum’s Children’s Poetry Competition will encourage children to write poems of their own and help teachers to bring poetry alive in the classroom. A teacher’s guide to accompany the competition will be available to download from the Children’s Poetry Bookshelf website (www.childrenspoetrybookshelf.co.uk) from early September, along with further information about the competition. Carol Ann Duffy is joined by a distinguished panel of people who either write poetry for children or are passionate about it: John Agard, poet and playwright, whose Young Inferno has just won the 2009 CLPE Poetry Award; Antonia Byatt, Director of Literature Strategy at Arts Council England; Gillian Clarke, National Poet of Wales, playwright and translator; Janetta Otter-Barry, Publisher of Janetta Otter-Barry Books, an imprint of Frances Lincoln; and Roger Stevens, poet, author, musician and founder of the Poetry Zone website. Cox & Power’s sensational space in London’s Marylebone High Street. Alice in Wonderland (1988), Willy’s Pictures (2000)and Into the Forest (2004), as well as magnificent finished pieces. The Exhibition will run for two weeks, from Saturday 17th October until Saturday 31st October 2009 and all of Anthony’s books will be available across the road at Daunt Books. Saturday 17th and Friday 23rd October, from 11am-1pm and 3pm-5pm. 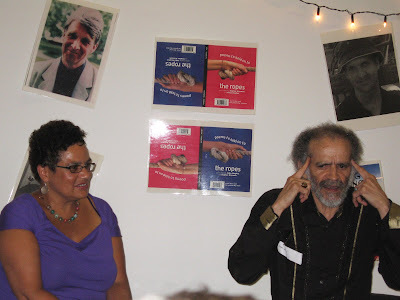 The presentation was made at the Centre for Literacy in Primary Education on Tuesday July 7th 2009 by last year’s winner Jackie Kay. The original idea for the exhibition, curated by Quentin Blake, was taken from a Victorian parlour game in which you draw pictures of your favourite things to create a cryptic self-portrait. For this exhibition, 45 people in the public eye were asked to illustrate eight favourite things from a list of twelve, in order to create a self-portrait. Contributors were asked about their favourite animal, book, clothes, comfort, food, pastime, place, possession, music, shoes, weather and their pet aversion (the thing they love to hate!). The contributors to the exhibition were all selected for having the skills to express themselves visually, and were encouraged to use whatever medium they most enjoy. Among the famous people whose work appears in the exhibition are: Andrew Marr, Anna Ford, Brian Eno, Eric Clapton, Eric Carle, Jack Penate, Jan Pienkowski, Sir Paul Smith and Shirley Hughes. The resulting works are diverse in style: from Quentin Blake’s instantly recognisable pen and ink drawings of people and Shirley Hughes’ enchanting watercolours to Lauren Child’s unique combination of text, drawing and collage and a series of polaroid photographs by portrait and fashion photographer Mary McCartney. The exhibition is running at Manchester Art Gallery from 4th July to 31st August and at Wingfield Barns in Suffolk from 4th to 30th September.